I am delighted to announce the launch of a peer review mentoring program for early-career scholars in nursing! 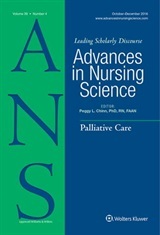 The ANS Advisory Board has approved this plan in the interest of promoting the entry of new peer reviewers for scholarly publication in nursing, and to more fully enact our dedication to diversity and inclusion in the publishing process. We are encouraging current members of the review panel to participate in this process. If you are an early-career scholar who is not yet involved in serving as a peer reviewer, let us know you would like to participate in this program and we will facilitate locating a mentor for you! The full description of the program is available for download here. Participating as a peer reviewer for scholarly publications is not merely a volunteer service — it is crucial to assure the credibility of published scholarship in any discipline. The main reason that this function must be voluntary is to avoid any possible appearance of conflict of interest, or vested interests influencing or controlling what appears in the literature of the discipline. However, subtle bias can creep in to the peer review process, especially when reviewers tend to hold dominant points of view that might exclude less well known or accepted perspectives in the nursing literature. So through this mentoring program, we hope to engage early-career scholars who have demonstrated excellence in scholarship while at the same time bringing to their work diverse perspectives that will be increasingly vital to the future of nursing. Let us know you want to participate!